Petersham. Succulent Portuguese chicken, a vibrant local community on the edge of a modern day metropolis. All this and more on your door step so what’s holding you back? If the answer is poor mobility than you need Sydney Wide Chiropractic to turn your life around. As the leading chiropractor in Petersham we offer accredited and trained practitioners who specialise in multiple modalities meaning we have the answer to your back or neck pain problems, no matter what. Our commitment to you is a program that improves nervous system function through safe and proven chiropractic methods and our results speak for themselves, 11 years of clients who have seen vast improvements in spinal, neck and pelvis oriented issues. Modern life is fast paced and can wear you down so you deserve the best possible care when your health is at stake. Whether you need relief from back or neck pain to more specific issues like ongoing headaches or other isolated pains we have the track record and the skills to set you back on track and remove those unwanted ailments for good. 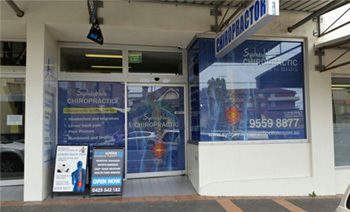 Our standing, as the premium chiropractor in Petersham, is built on our comfortable and welcoming procedures with just a simple 45 minute initial visit the stepping stone to a life lived pain free. With an affordable and attainable program tailored to your individual needs the time has never been better to take your wellbeing into your own hands. Unlike our competitors, we don’t want to see you stuck in a cycle of chiropractic care that brings you back time after time. On the contrary, at Sydney Wide Chiropractic we educate and encourage our patients with the information and tools that will allow them to better manage their own health going forward, we are here because of you and for you. So if you’re ready to make the change to a healthier and more dynamic way of life then give us a call today on (02) 9559 8877 or email us at info@sydneychiropracticclinic.com.au to organise an appointment today.